Our engineers recently debuted a self-contained, three press system with one central press controller for compression molding composite medical parts. Each compression press was designed with three daylights, totaling nine pressing surfaces to effectively increase production rates. Each press is capable of 10 tons pressing capacity. The six inch square solid steel plate pressing surfaces were designed with one heat and cool zone per platen and independent setpoints on each lower and upper platen for energy efficiency and to maintain consistent temperature throughout the molding process. In addition, each pressing surface is equipped with a programmable fan to accelerate temperature reduction on the mold during the cooling cycle. The press controller consists of a NEMA type enclosure and is mounted on the side of the press system. The new generation PLC microprocessor system features a 10.5 inch color screen interface. Each press function displayed, including a red light mounted on top of the controller to signify the “End of Cycle Alarm” and press limit switches. The press controller shows a digital readout of press force for sampling concurrent with sampling of temperature. Press force is recorded in the system, as well as time and temperature history which can be used to confirm process repeatability. Point of operation guarding is available and can be designed subject to the customer’s process and the customer’s apparatus to shuttle parts in and out of the presses. All press systems are totally assembled, painted and tested for customer inspection prior to shipment. Our in-house service technicians and engineers are available for start-up assistance, service and trouble-shooting as requested by the customer. Our service department has 24-hour accessibility by phone, reducing downtime concerns. As a custom solutions provider, our sales and engineering teams partner with our customers to understand their processing applications and custom design press solutions that meet their specific needs. 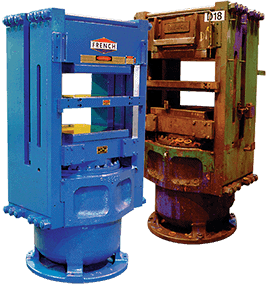 French and TMP composite presses come in upacting or downacting configurations, with tonnage capacity up to 3,000 and packages for high temperature heating up to 1200 °F to produce critical composite components for the aerospace, automotive, defense, medical, sporting industries and more. 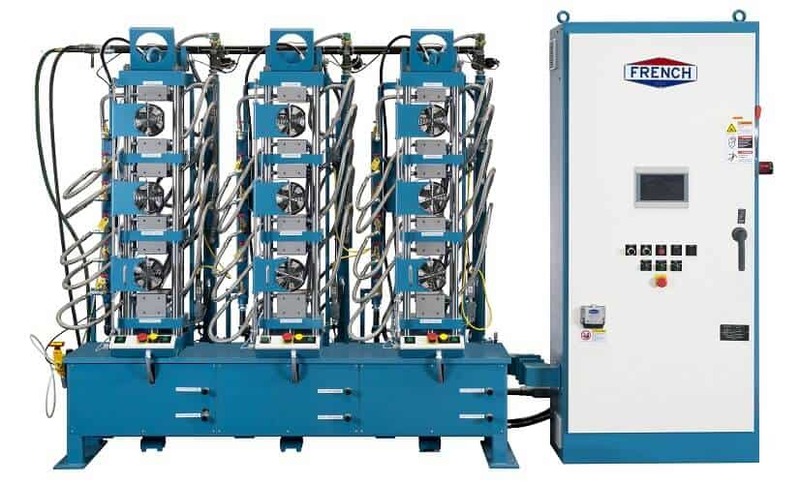 Hydraulic press models can be fitted with process improving features including loading and unloading automation systems, vacuum chambers, tilting platens and advanced electrical control packages that give customers greater press control and flexibility. To learn more about our custom hydraulic press solutions, visit us in booth N29 at the CAMX Expo taking place October 16-18, 2018, in Dallas, Texas. You may also download literature and review our press galleries or call us at 937-773-3420.